Drying your flowers is a nice way to extend the life of your garden. However, if your dried flowers end up turning brown in the drying process, you probably will not want to save or display them. There are a few tricks you can use to preserve the color of your blossoms. Even if you don’t think they are as vibrant as freshly cut ones, they will be enjoyable. Pick your flowers when they are fresh and dry from the morning dew or rain. Make sure you use a sharp scissors when you cut them so you do not crush the stem and then place them directly into a water container so they do not wilt. Keep the flowers out of sunlight and make sure they are in total darkness when you dry them. 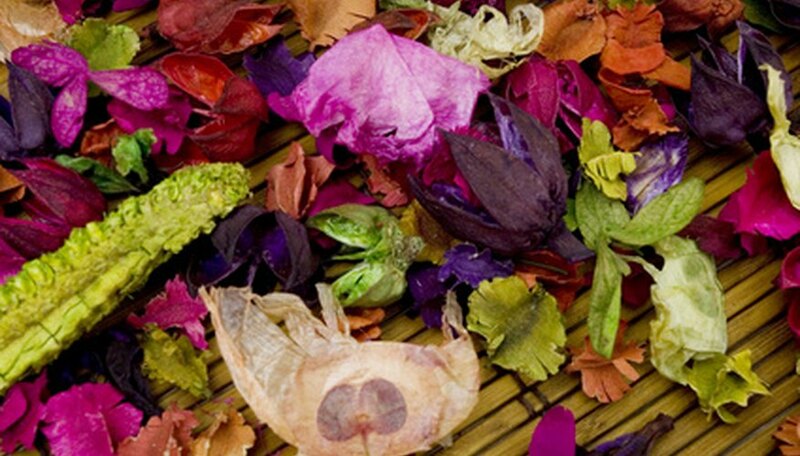 The light will bleach the colors out of dried flowers over time, leaving them dull and unattractive. Tie small bunches together with twine and hang them upside down in a closed paper bag to dry in the dark. Use the drying materials like silica and borax only as long as necessary as the extra drying time will end up pulling the color out of the flower and making it too brittle. Silica is the fastest material, needing only two days for thin flowers, while borax may take up to three weeks for thicker flowers. If the petals are brittle, you have dried them too long. Add a teaspoon of baking soda to every 5 pounds of drying agent. This will increase the pH of the mix, which seems to help retain the color of the flowers. According to Al Pertuit, a floriculture specialist from Clemson University, the sand used by the best connoisseurs of dried flowers is oolitic sand, which is naturally high in pH and very fine so the flowers are not marred by sharp edges.